Its a new year and it seams that I have neglected this blog a bit. I hope to be posting a lot more here in 2019! Here is a delicious asian inspired chopped salad that is easy, filling and always a favorite. Cheers to a fantastic new year! I'd love to hear your feedback so drop a friendly comment or two. Mix all together until smooth and emulsified. Pat dry the block of tofu with paper towel. Cut the block into slices and then those slices in half on the diagonal to make triangles. In a hot non stick pan add sesame oil. Place your tofu triangles into the hot pan let sear. Season the tofu heavily with an all purpose seasoning. flip your tofu and season the other side. Douce the tofu with soy sauce cook until golden brown to make a caramelized crust to the tofu. Set aside. Cook the thin rice noodles according to the package directions, let cool and set aside. Chop the romaine, cabbage, green onions, and carrots mix together with the protein greens. Toss with the peanut sauce. Spirilize the cucumber, chop the red pepper, avocado, and snap peas. 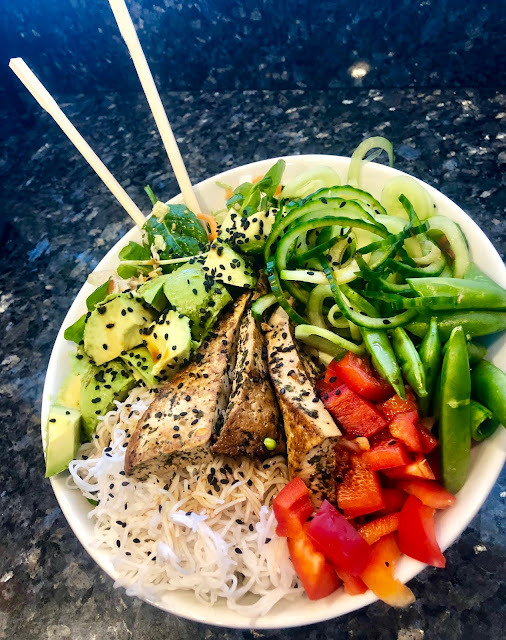 In a large bowl Add the chopped salad mix, layer a large handful of the rice noodles, snap peas, avocado, red pepper and tofu. Garnish with black sesame seeds. Serve! Enjoy and remember to always be mindful and eat with compassion! I'm back.....sorry for the pause! Sometimes life gets in the way. America's obsession with protein is a bit silly, we really don't need that much to thrive. Guess what, all plants provide protein...bonus! The focus in our every day diet should really be fiber. Here is a delicious, hearty, protein packed, fiber rich, plant based salad. Wash and remove the kale leaves from the stem. The stem is very bitter so you defiantly do not want to eat this part of the kale leaf. Chop up your kale leaves and place them in a large bowl, I use a wooden bowl because I swear it makes the salad taste better. Add the olive oil, apple cider vinegar, garlic, lemon juice, and salt and pepper. With a clean hand massage all of these ingredients into your kale for at least 3 to 5 minutes. This step is very important you want tender yummy kale leaves. Next let this mixture marinate into the kale leaves for a good hour before adding the extra cooked, chopped, and toasted ingredients on top. Toss and serve! The Best Cruelty Free Mac & "Cheese"
Before I became vegan I was an expert on Mac & Cheese. I am a true starchavore. I will pick savory over sweet any day and this dish was high on the list. Here is a non dairy, cruelty free, and healthy option that squashes all of those strong cravings. This recipe does not disappoint, its rich, creamy and full of that sharp, tangy cheddar flavor. 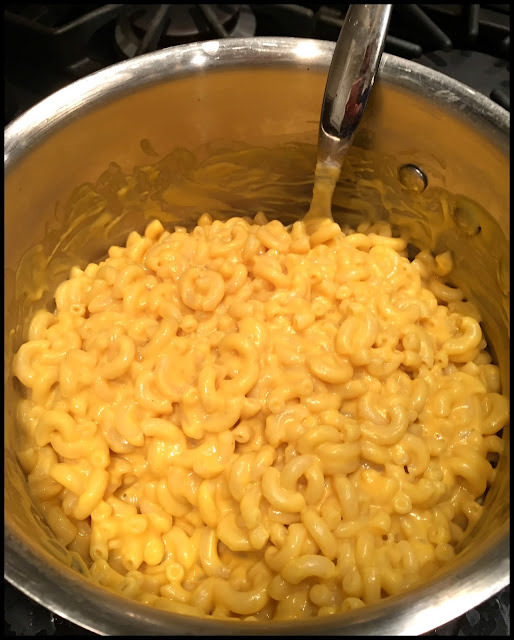 One hour before you make this Mac & Cheese soak one cup of cashews in water to soften them. In a small saucepan boil the potatoes, carrots, and onion until soft. I keep the peel on the potatoes for extra fiber. In another saucepan cook your elbow pasta until al dente, drain and return to saucepan. Pour the vegetables and the remaining water from the boil to a Vitamix or a high powered mixer. Add to the mixture, the drained but softened cashews, garlic, lemon juice, Nutritional Yeast, mustard, and salt. Blend all of these ingredients on high and until the mixture is smooth. Taste and add more of any other spice you would like. 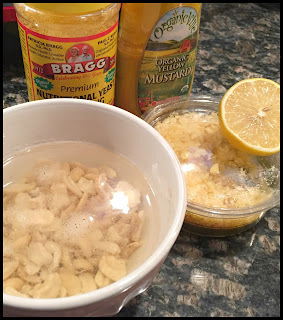 Sometimes I add more garlic, or nooch (nutritional yeast) depending on the day. Pour the hot creamy sauce over your freshly cooked noodles and stir to coat. This is when I add the freshly cracked pepper. 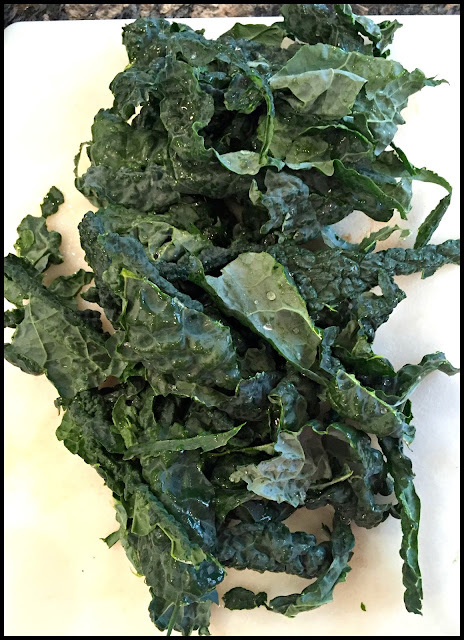 Lots of people turn their nose up to kale because they don't prepare it correctly. I crave this salad and find myself eating it at least three times week, it's that good. This recipe is my version from the restaurant True Food, my recipe is a bit spicier and minus the cheese of course. Wash and remove the kale leaves from the stem. The stem is very bitter so you defiantly do not want to eat this part of the kale leaf. 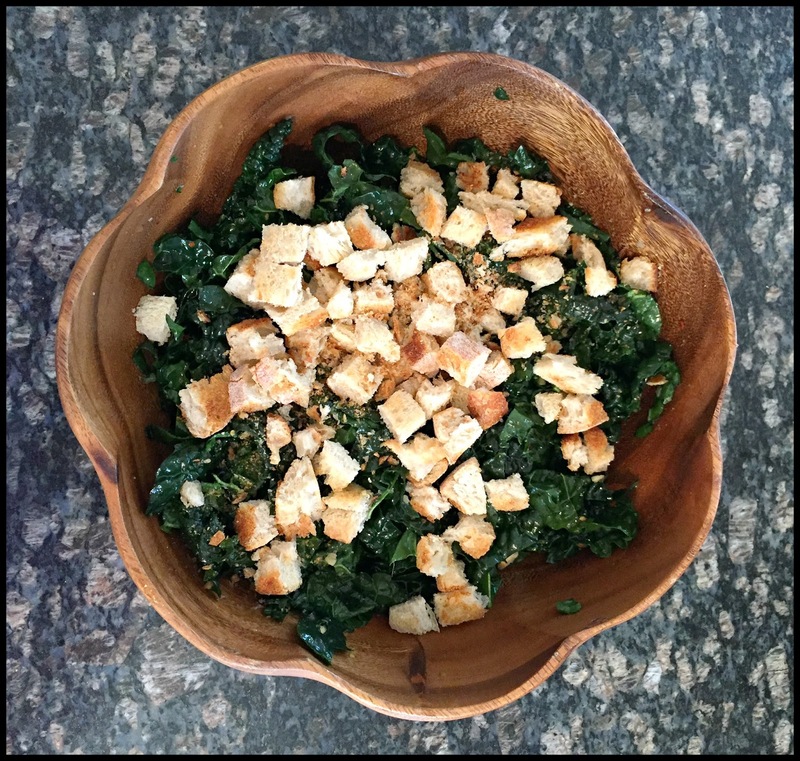 Chop up your kale leaves and place them in a large bowl, I use a wooden bowl because I swear it makes the salad taste better. Add the olive oil, apple cider vinegar, garlic, lemon juice, red pepper flakes, & salt and pepper. 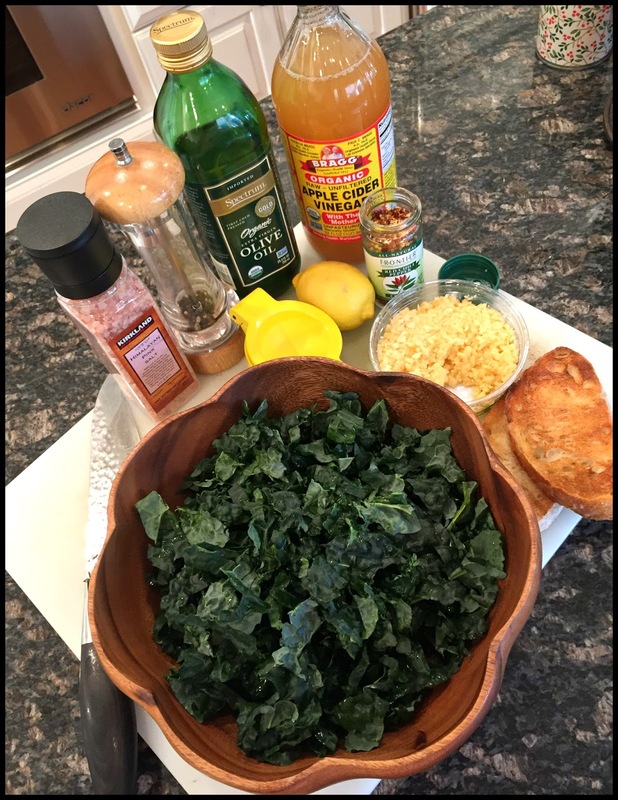 With a clean hand massage all of these ingredients into your kale for at least 3 to 5 minutes. This step is very important you want tender kale leaves. Next let this mixture marinate into the kale leaves for a good hour before adding the chopped toast on top and serving. 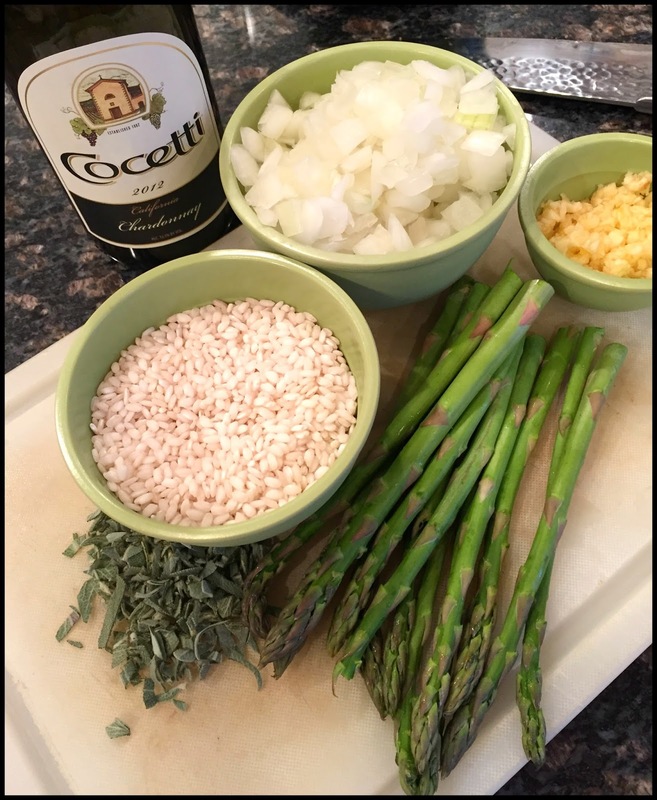 My favorite season is here and I'm excited to start cooking comfort food. This rich healthy dish will warm you from the inside out. I love the nuttiness of roasted butternut squash and when paired with sage the flavors pop and really compliment each other, perfect on a cozy fall evening. On a cookie sheet lined with parchment paper lay out your cubed butternut squash and dry roast it in the oven at 425º until soft and starting to get golden brown. Take the butternut squash out of the oven and set aside. Next in a large saucepan on medium high heat add olive oil and the chopped onion let this cook until the onion is caramelized. At this point add the dry Arborio rice and lightly toast the rice in the sauce pan stirring constantly. When the rice is lightly toasted turn down the heat to medium and add 1 cup of white wine to deglaze the pan, stir the rice mixture constantly until all the liquid is absorbed. Next add the chopped garlic and sage along with another cup of white wine. When you add liquid to the Arborio rice you have to stir constantly until all the liquid is absorbed, this will be an arm workout but well worth it. Next add the dry roasted butternut squash and 1 cup of vegetable broth. Stir and repeat adding the vegetable broth cup by cup 3 more times. At the end add the chopped bunch of asparagus and stir in. At this point your mixture should be thick and creamy and your rice should be fully cooked. If your rice isn't cooked all the way through add another cup of vegetable broth and repeat the process of stirring until the liquid is absorbed. The rice should be completely done at this time. Add salt and pepper to taste and serve. 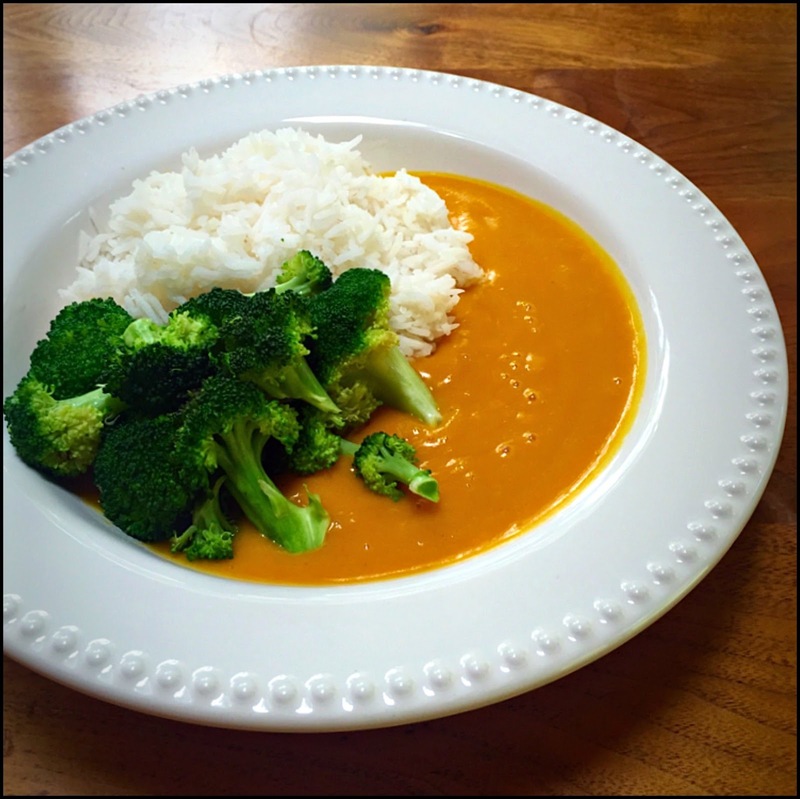 I know its summertime but a big bowl of butternut squash soup sounded so good. This recipe is so simple but so creamy, rich, and delicious. This soup would be a great dish to whip up when guests stop by unexpectedly. I'm going to be making this soup a lot this fall. While the squash is roasting put the basmati rice on to cook. 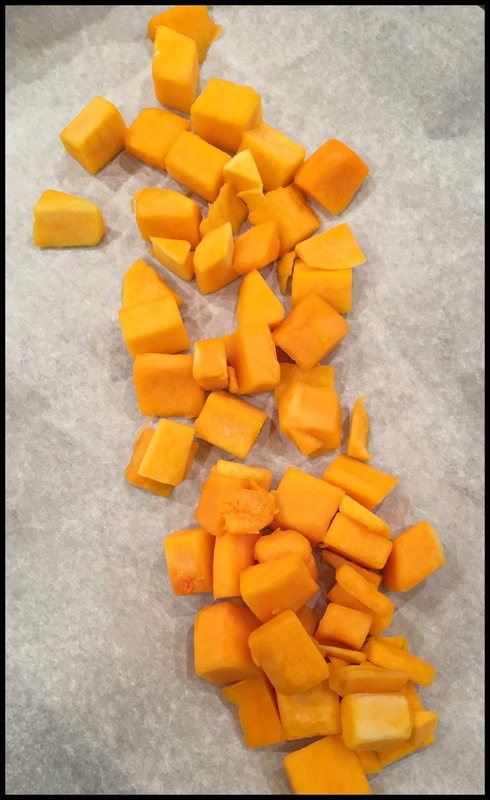 Scoop all of the cooked butternut squash into a high speed blender like a Vitamix. At this point add the coconut milk and half of your hot water and blend until smooth. Then add the curry spice and the salt, along with the rest of the hot water. Blend on high for several minutes until the soup is smooth and soup consistency. You might want to add more water if you like a thinner soup. Steam the broccoli last so it remains warm. Serve like pictured. Anyone who knows me, knows that I am obsessed with potatoes. When I was little I would eat them raw, that's how much I love them. 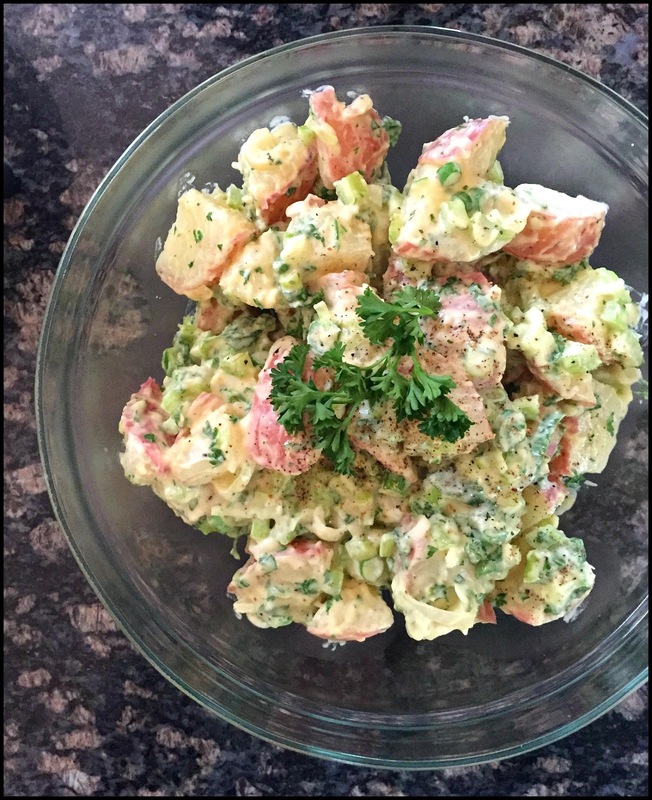 The classic potato salad recipe just spells comfort food, maybe it's the German in me. Being vegan of course we do not eat your traditional mayonnaise made with eggs. Instead I used Just Mayo an all plant based mayo which is heavenly, in fact Just Mayo is better than the traditional mayo. Just Mayo is tart and sweet all at the same time giving this salad an awesome plant based kick. Wash and chop your raw potatoes into bite size chunks. 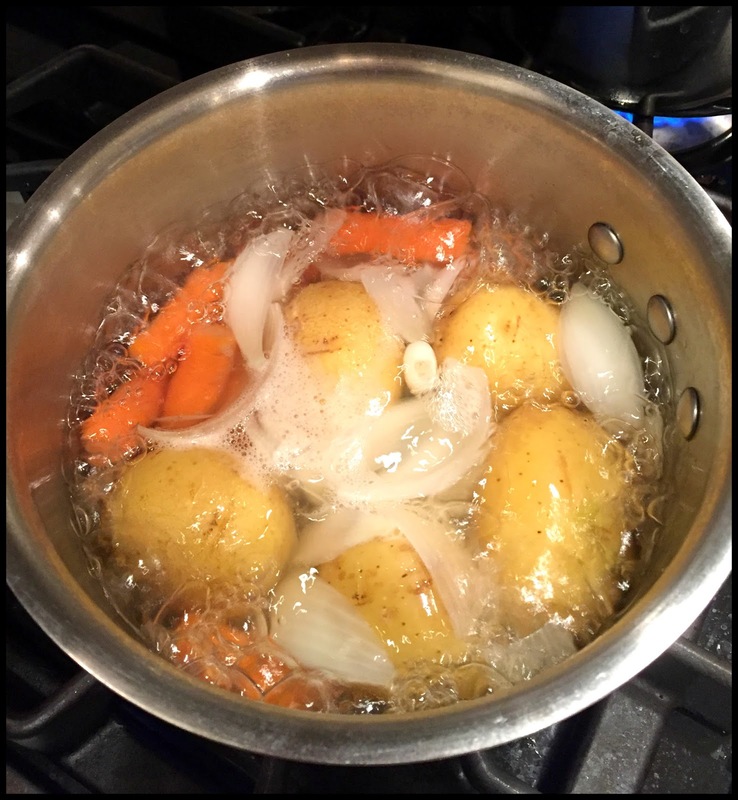 Add your potatoes to a pot of boiling water with about 2 tablespoons of sea salt. let them boil until tender. 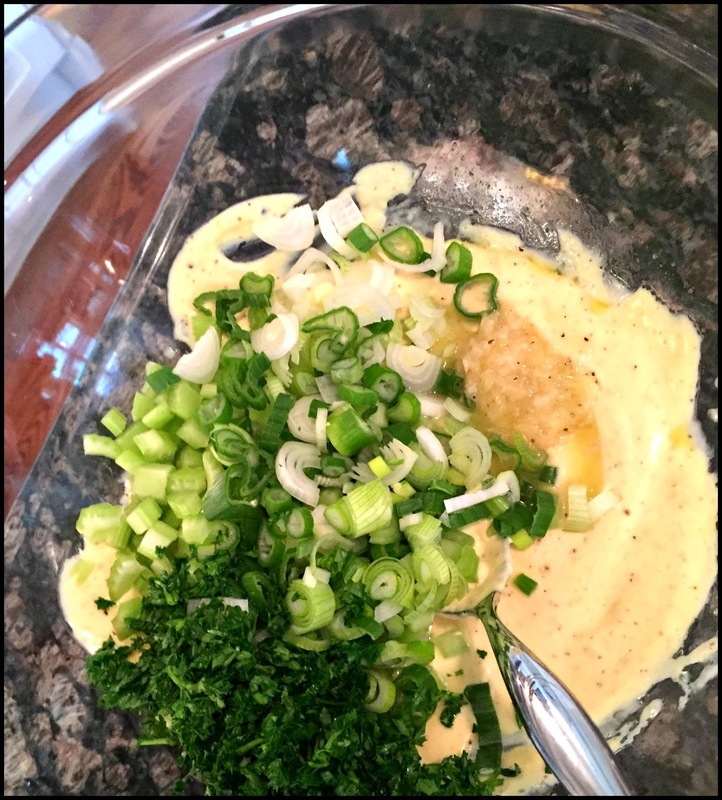 Meanwhile in a large bowl add your Just Mayo, olive oil, Dijon mustard, lemon juice, and vinegar. Whisk all of these ingredients until its almost fluffy. Then add the chopped celery, sliced green onion, and parsley. When the potatoes are done cooking drain and add them to the Just Mayo mixture. Stir until all the ingredients are well mixed. Then season to taste with sea salt and freshly ground pepper. Refrigerate until the salad is cold and then serve.